EduTab Kids is another innovative product from mobule edutab. EduTab Kids contents are global standardized fully digital pre-school curriculam starts from playgroup / Nursery, LKG (Jr.KG), UKG (Sr.KG). Highly interactive content and curriculam attracts young minds and increase better engagment and enthusiasam. 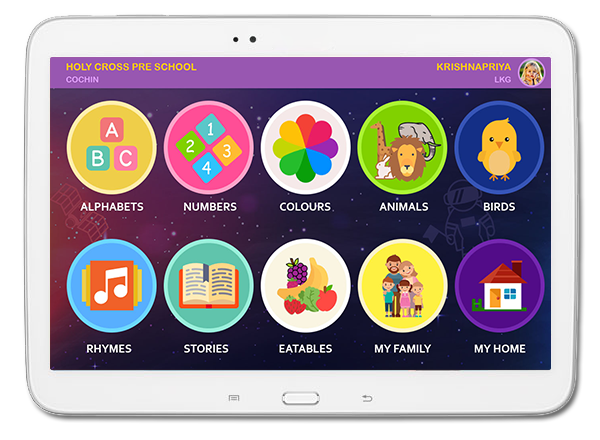 The product is designed with the help of pediatric psycologists, highly experienced play school curriculam experts, Pre school Teachers and Digital UI & UX Experts. We designed the entire curriculam suits with 3 important aspects of learning & Teaching, Interactiveness, Creative and Intelligence. Teacher controlled / self driven curriculam plans help the young minds to be better engagement in activities rather than looking into a blackboard. EduTab Kids help the young minds to be more creative in their learning process by doing search & Recognize model. Some of the best engaging methods like Inboard Writings, Drawings, Colourings, Drag & Drops, various Games, Interactive Worksheets, Reports etc. EduTab Kids follows a new gen educational method called VEL (Virtual Experimental Learning) System, here the young minds are listerning, seeing, involving, searching & recognizing throughout their learning lifecycle. Our collaborative curriculam built with global standard and the better understandig of young minds better engagements, tastes and User Behaviours. Some of the topics we cover are from Alphabets, Numbers, Colours, Vegetables, Fruits, Rhymes, Stories, Birds, Animals, Things Around, story making, mathematics, drawings, colorings, my diary etc.